Some teams will focus on the general classification Yellow Jersey, whereas others will focus on winning sprints for The Green or the King of the Mountains Spotted Jersey. There are many rules, both spoken and unspoken, as teams stand to gain a lot from cooperation and respect. 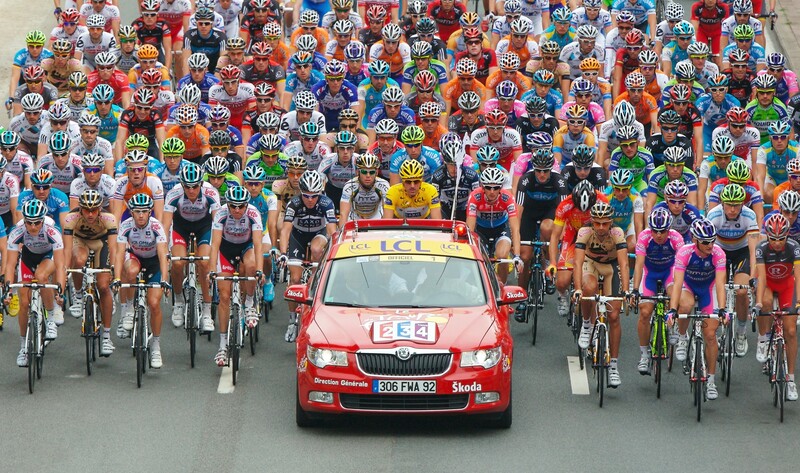 Here is what you need to know to enjoy watching Le Tour. 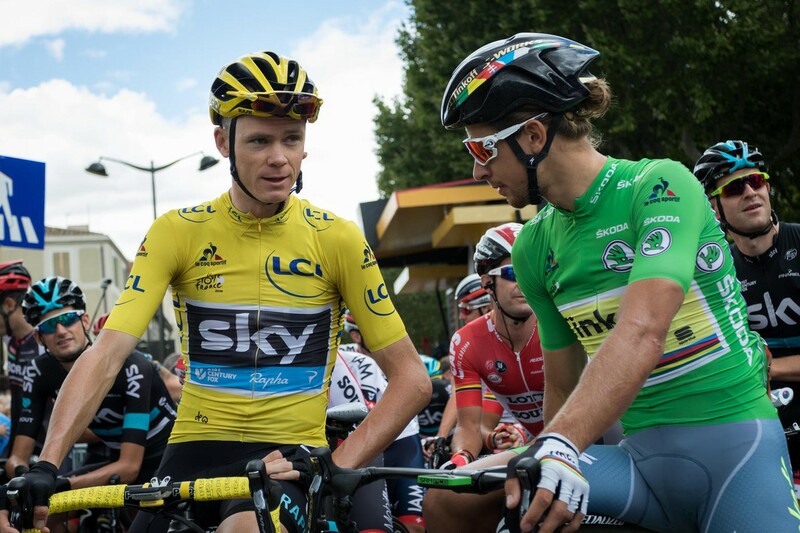 The start of Le Tour is always an edgy affair as teams compete to establish themselves at the head of the peloton. Crashes and injuries are a real risk, so team leaders need to be protected by their domestiques who effectively muscle everyone else away. The irony is, the more the teams muscle each other away, the greater the risk of crashes in the peloton. The safest place to be is the front, and everyone is fighting to be there. This Catch 22 situation is almost impossible to mitigate through any official rules, but it’s exciting to watch. Winning the General Classification (GC) means you get to wear The Maillot Jaune, aka The Yellow Jersey. To win the GC the leader of a race team must complete all the stages with the lowest overall time. This means that a GC contender should be a solid all-rounder, equally at home on the mountains as they are in time-trial stages. It can become confusing when you consider a rider could win the GC without winning any individual stage. Think of it like this – Mark Cavendish may win every flat stage suited to a sprinter, but will probably finish mountain stages at least 20 minutes behind the likes of Nairo Quintana, whereas Quintana will finish a sprint stage within 3 minutes of Cavendish. Regardless of who wins the overall Yellow Jersey, an individual stage win on Le Tour is always a special event, and smaller teams will often target one or two specific stages out of the Tour simply to get on the podium. Breaks are the coolest way to achieve that, but not the easiest. Early on in a stage you may see a small group of riders attempt a break. Usually these are lower order riders with nothing to lose – they keep their sponsors happy by grabbing TV coverage, and most of the time they’re easily caught by the peloton that uses energy much more efficiently. That doesn’t mean that Yellow and Green Jersey contenders can’t have some fun going for a break, but they’re only likely to do it when conditions go in their favour – and in 2016 that’s exactly what Froome and Sagan exploited. Stage 11 of Le Tour was plagued with crosswinds, so the peloton had been doing their best to speed through it. Sagan found himself at the front with Thomas, Bodnar, and Froome. The Peloton was battered and bruised from minor crashes down the coastal route from Carcasonne, so when Sagan attacked, few cyclists felt confident enough to respond. Froome leapt on Sagan’s wheel, and Bodnar and Thomas read the situation and realised a fully-fledged Royal Break was on the cards, with both the Yellow and Green Jerseys of Froome and Sagan committed to escaping the peloton. Sagan won the stage, and Froome put a significant dent into his rivals for the Yellow Jersey, finishing the stage in 2nd place. Points are given at the top of climbs for suitably impressive performance, so specialist climbers have an advantage. Climbs are categorised from 1 to 4, with 1 being the steepest. The numbers loosely correspond to the gears of a car – so to drive up a Cat 1 climb you’d need to stick your car in first gear. Race planners may give big points at the top of a Cat 3 climb if it’s deemed long enough to pose the same challenge as a shorter Cat 1 climb. I should add that there is one climb more difficult than a Cat 1 climb – the Hors Catégorie (HC). An HC climb is beyond categorisation and originally described a climb so severe a car couldn’t pass. Points can be given for winning sprints at various parts of a stage, often early on to encourage teams to either up the tempo in the peloton or break early in the hopes the break may succeed. 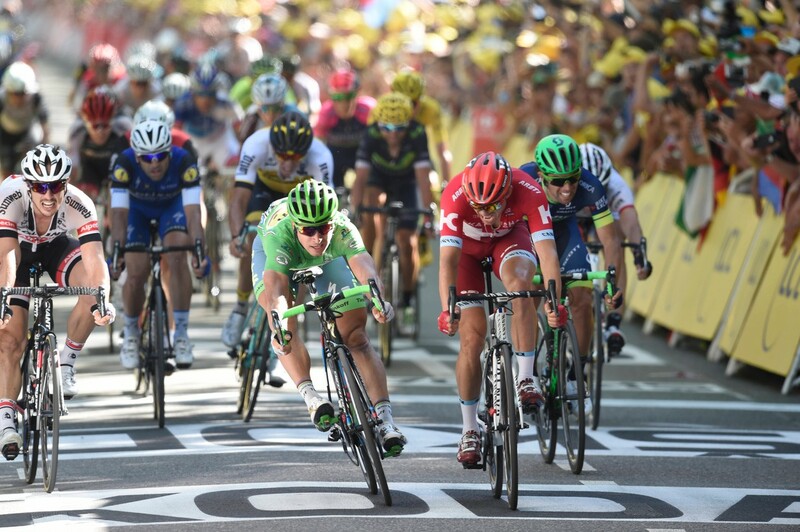 More points are given to the sprint at the end of the stage, and this encourages teams with specialist sprinters like Sagan, Greipel, Kittel, or Cavendish to stay together. This leads to a similar paradox of teams trying to dominate the front of the peloton to give their team leader a clear run at the finish line. Peter Sagan (Tinkoff) took his third stage victory in the 2016 Tour de France, winning stage 16 into Bern. 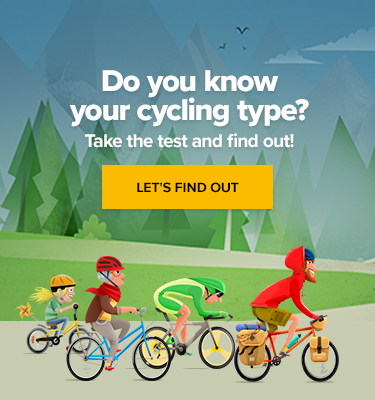 The classic race rule applies – the rider with the racing line may stick to it knowing that any competing cyclist will yield their line when they realise they have the disadvantage. Naturally, this doesn’t always work in the heat of the moment and spectacular crashes are a real risk in bunch sprints.